Mark Lennihan/APThirteen years after the last Continental rolled off the assembly line, Ford is resurrecting its storied nameplate. This concept was shown off at the New York Auto Show. 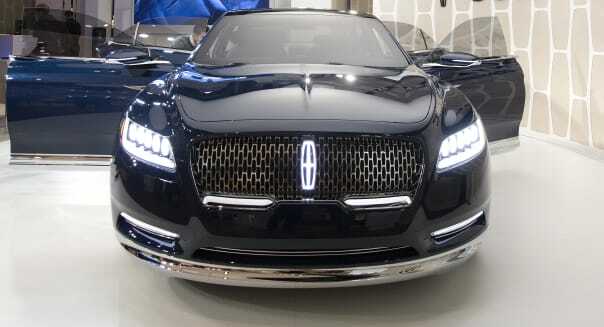 Ford (F) has unveiled its Lincoln Continental concept. The big, plush luxury sedan previews a new Lincoln model that Ford plans to offer next year. It will replace the current Lincoln MKS, a slow seller that has received tepid reviews, and it will serve as a flagship for the brand in the U.S. and China. Yes, China. Ford has begun a huge effort to establish its old luxury brand in China, and the new Continental will be a key part of its strategy. At one point, former Ford CEO Alan Mulally was determined to kill the Lincoln brand, thinking it a slow-selling drain on Ford's resources. But Mark Fields, who eventually became his successor, talked him out of it. Why? The answer seems to be that Ford sees a big opportunity for the brand in China. Kumar Galhotra, the Ford executive who serves as president of the Lincoln brand, says that Ford's market research in China uncovered something very interesting. "Lincoln is a highly regarded brand in China," Galhotra said during an interview in New York last week. "Its perception of prestige is better than that of Audi. The favorable opinion is better than Lexus. And a lot of that is driven through our heritage. Chinese consumers are very tuned into the Lincoln heritage." Galhotra and other Ford executives have said that Chinese consumers see Lincoln as the brand of Hollywood movie stars and U.S. presidents. That hasn't really been true in a while, but that doesn't matter: Ford is determined to bring a Hollywood-worthy Lincoln to curious Chinese customers. That's where the Continental comes in. Galhotra said that Ford "took a lot of input from Chinese customers while designing this vehicle." Chinese tastes and needs influenced everything from the Continental's soft-but-imposing shape to the (vast) size of the rear-seat space. In China, luxury-car buyers are often chauffeured, meaning that the back seat is where the owner rides. The Continental Concept caters to rear-seat passengers with separate panels for climate controls, a lap tray that can support a tablet computer -- and most important, a lot of legroom. But of course, Chinese customers aren't the only ones who will enjoy having room to stretch out in the back seat. "I think that American customers will enjoy the big back seats just as much," Galhotra said. Galhotra confirmed that the Continental concept is "very close" to the new Lincoln Continental sedan that Ford will put into production next year. And while China will be an important market for the new Continental, perhaps even the most important, Galhotra says that the Continental will be made only in the U.S. for now. Many cars nowadays are developed as global models, allowing automakers to reap maximum advantage of their economies of scale. With China now the world's largest new-car market, that means that Chinese tastes are having more and more of an influence on the cars we buy -- and not just big expensive luxury sedans. That's not necessarily a bad thing. As Galhotra said, Americans also like having more rear-seat legroom. But the effort to balance the needs of American and Chinese buyers might have resulted in some new compromises. For instance, the Continental Concept's body lines are soft in a way that a Chinese buyer might see as "understated elegance." Would an American think it "a bit bland"? There's nothing bland about the overall shape and presence of the Continental concept in person. But its styling is clearly less dramatic than it could have been. It's an example of the balancing act between regional tastes that more and more automakers are doing with their latest models. Much of this will be great for car-buyers everywhere: We all want safer, more practical, more fun-to-drive cars. But there's no doubt that the voice of the Chinese car-buyer is going to be heard more loudly than ever before, even by the most American of brands. Motley Fool contributor John Rosevear owns shares of Ford. The Motley Fool recommends and owns shares of Ford. Try any of our Foolish newsletter services free for 30 days. Check out our free report on one great stock to buy for 2015 and beyond.